I joined the always lovely Kulja Coulston on 3RRR’s The Grapevine last Monday morning to talk about Ride to School Day. Also a guest in the studio was Dr Ben Rossiter from Victoria Walks talking about their initiative Walk the Block later in the week. We delved into the always sensitive topic of riders and pedestrians sharing spaces, and footpaths, just to spice things up! You can check out the podcast here is you’re so inclined. We’re very busy getting everything in place for the Treadlie Bike Hub which kicks off on February 14th. I dropped in to 3RRR on Monday to chat with Kulja Coulston on the Grapevine about the TBH and bikes in Melbourne in general. If you’re a regular listener to the Grapevine you’ll know what a great programme it is. You can tune into the podcast here if you want. 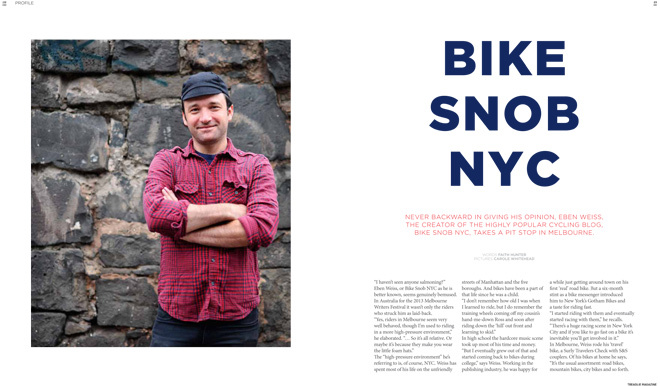 NYC blogger, Bike Snob NYC or Eben Weiss, was in Melbourne earlier this year as part of the 2013 Melbourne Writer’s Festival. I met up with him, both to pre-record an episode of the 3CR Yarra BUG Radio Show and also to interview him for Treadlie Magazine. As anyone who has read his blog will know, Eben does a fine line in snarky wit and has a low tolerance for the wankier aspects of bike culture. My bike, well at least the one I use most days, is pretty well kitted out with bits and pieces that it occurred to me, Eben might find pretty wanky. Hammered mudguards, porteur rack, custom leather saddle and grips. Not to mention the coaster brake. So meeting him for a ride down to 3CR’s studio in Collingwood was a fairly nervewracking affair. Luckily, Eben was either too jet-lagged or too polite to comment on or notice any of it. I mean, there was an almost imperceptible smirk when at one point I let slip about the coaster brake, but as I said, too polite. Or too jet-lagged. We rode down to Collingwood, discussing gentrification and its effects, mixed neighbourhoods and inner-city wankers, the pros and cons for cyclists, before meeting ace photographer Carole Whitehead for a photo shoot. Brooklyn and Fitzroy were compared while we sought out photogenic bluestone and graffiti. We finished up at the 3CR studios with plenty of time to chat before recording our interview. The interview unfortunately, I can no longer find online. 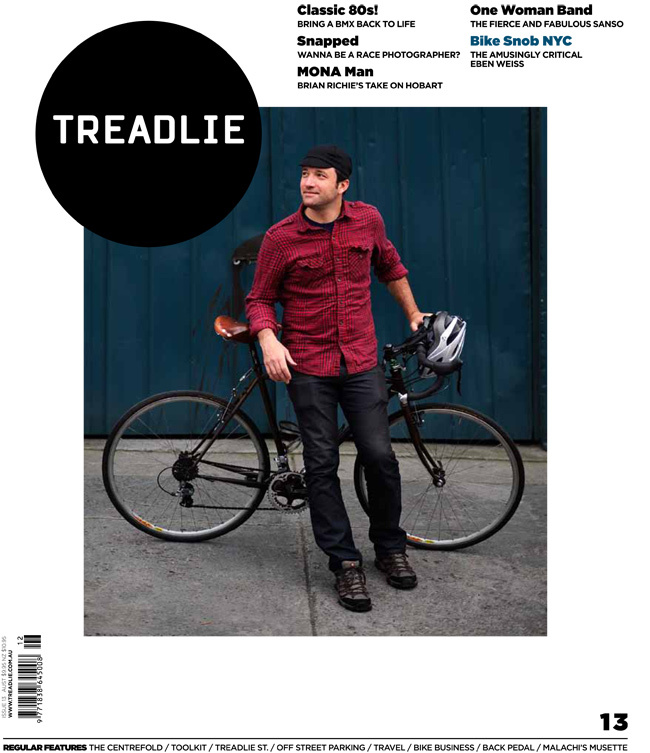 The story, you can read in Issue 13 of Treadlie magazine.